This story originally appeared on ComoLagoBike 30-June-2018. The first weekend of July the staff of Hotel Il Perlo Panorama and ComoLagoBike are delighted to host Giro d’Italia winner, Andy Hampsten, and his guests from Cinghiale Cycling Tours. During their stay on beautiful Lake Como, the guests will ride two of the region’s famous climbs, the Ghisallo and the Muro di Sormano. Also as part of Cinghiale’s visit is a special event at the Ghisallo Cycling Museum. On Friday, July 6 at 9 p.m. there will be a public presentation by Hampsten as he donates his 1988 Giro d’Italia Maglia Rosa to the museum’s collection of pink jerseys. The discussion of the donation began a few years ago when Hampsten met Italian cycling legend Fiorenzo Magni, who was the President of the Ghisallo Cycling Museum until his death in 2012. One of Magni’s great achievements for the museum was soliciting his friends and fellow competitors for their pink jerseys to build the museum’s Giro for Ghisallo collection. It was hard for Hampsten to say no to Magni, a champion who raced alongside Fausto Coppi and Gino Bartali during the postwar “golden age of cycling” in the late 1940s and early 1950s. Known as the third man in this trio of legends, Magni won the Giro d’Italia, Italian Nationals, and the Tour of Flanders three times each. His hard-man race ethic in the cold and wet northern classics earned him the nickname as the original Lion of Flanders, a trait which persisted throughout his race career whenever faced with overwhelming and challenging situations. Although he did not leave with the Maglia Rosa, Magni considers his greatest “’win” at the 1956 Giro d’Italia, his last year as a pro. Magni’s incredible physical and mental strength were pushed to their limit after he crashed in Stage 12 and broke his collarbone. Unable to control his bike or climb without the use of his left arm, he still refused to quit. 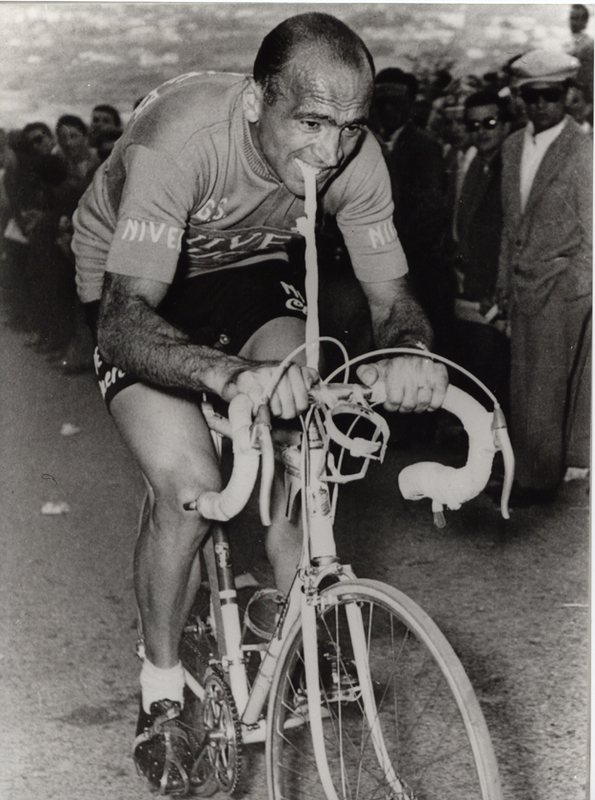 His mechanic outfitted him with a piece of bike tube that was tied to his handlebars and clenched with his teeth to provide leverage as he climbed. On Stage 16 he crashed again on the same arm and broke his humerus. Still refusing to quit and despite the incredible pain he continued to race, even climbing the Stelvio and the snow-filled passes of Stage 20 when sixty people and even the race leader quit. His tenacity and grit allowed him to finish an incredible 2nd place in the Giro. After retiring from cycling that year, Magni became a notable automobile businessman near Milan and was still active in the Lombardia cycling community. At the end of the 20th century it became apparent to the patrons of the Madonna del Ghisallo chapel that the small building could no longer house its large collection of cycling artifacts. So with the same grit and determination, Magni led the effort to create a large, modern museum that would have the greatest collection of cycling memorabilia in the world. Together with the Regione Lombardia and Magreglio community, Magni led fund raising initiatives and even made his own donations from his cycling accomplishments. In October 1999 the first stone was laid for the museum. In 2006 the light-filled Ghisallo Cycling Museum, with unimpeded views of the lake and surrounding mountains, opened with a blessing from Pope Benedict XVI. Magni became the museum’s first President, continuing the effort to build the largest collection of pink jerseys in the world. Magni encouraged his friends and fellow racers to donate their Maglia Rosa jerseys for the Giro for Ghisallo collection. When he and Hampsten met, Magni mentioned that he wanted to have a Maglia Rosa from every year and Hampsten was happy to contribute this symbol of his unforgettable victory. The story of Andy Hampsten’s victory in Italy is legendary, not only for being the only American in history to win the Giro, but also for his bold attack on Stage 14's Passo di Gavia in a blizzard, captured for the ages in this iconic photo below showing his own hard man determination. Hampsten had just soloed to a mountaintop win on stage 12 and with his 7-Eleven teammates was feeling strong and confident. The other racers were dreading a cold and miserable Gavia stage and mostly just wanted to survive the day and wished aloud that it would be cancelled. Although the Giro organizers insisted the roads would be clear and the weather cold but not dangerous, Hampsten's team had been encouraged to prepare for the stage’s inclement weather and to attack. Team Manager Jim Ochowicz stocked up on cold, wet weather gear such as jackets and gloves at a local ski shop. The team was also instructed to coat themselves from head to toe in lanolin to make themselves more impervious to the conditions. Along the route were the soigneurs and team car with bottles of hot tea and more warm clothes. Despite all the preparation the conditions were brutal even for the Americans, but they channeled their home roads of Colorado and pushed on, knowing that today’s suffering would be their path to glory. The famous photo of Hampsten storming through the blizzard shows his bare legs red from the ice forming and his hands gripping the handlebars in heavy black neoprene diving gloves. At the top of the climb the team support crew even gave him an additional wool neck warmer and large red wool cap. It was still a 25-kilometer descent into Bormio in even snowier and colder conditions than the climb so the gear kept him moving, albeit still miserable and freezing. Meanwhile the other racers coming over the pass were literally stopped in their tracks in the wet frozen conditions and even sought shelter in the tiffosi’s cars. Racing into Bormio the snow turned to rain and Hampsten was passed with 6 kilometers to go by Panasonic’s Erik Breukink, who won the stage by 7 seconds, but the heroic effort was enough to put Hampsten in the pink jersey. At the time the European teams did not give much thought towards cold or wet weather gear, so the American team’s ingenuity without a doubt is credited to Hampsten gaining time and racing into the Maglia Rosa. For the next week Team 7-Eleven still had to fight every day for Hampsten to keep the pink jersey. At the final stage, an individual time trial in Vittorio Veneto in the hills north of Venice, there were only two minutes separating the top three riders. The final racers were met with rain that made the road slick and treacherous in the turns where a fall could mean winning or losing the jersey, but Hampsten raced the ITT with caution and came across the finish line to keep the Maglia Rosa. After the podium presentation the team drove west to their home-away-from home in Lombardia to celebrate their unforgettable win at Bar Agusto in Villa d’Alme outside Bergamo along the Brembo River. Thirty years on, Hampsten still celebrates the Gavia stage every year with his family and friends. As a retired professional racer, Hampsten and his family have settled into a life split between Colorado and Tuscany. He first came to know the roads and culture of Tuscany when he was racing, but the region’s charms, from the weather to the food and wine, lured him to stay and open his Cinghiale Cycling Tours business. The name cinghiale comes from the Italian word for the wild boar that roam the woodlands of Italy eating nearly anything in sight, much to the consternation of locals – roots, nuts, berries, leaves, twigs, worms, insects, fish, lizards, even ripe vineyard grapes. The name for Hampsten's business clicked as a fun vision for his touring company: to wander around Italy eating and drinking whatever looks best, riding to the most interesting places even if they happen to be up hill. A passion for Italy does not come much more genuine than the winner of the Giro d’Italia, and Hampsten brings that passion to his guests, sharing his favorite places in Tuscany and beyond and introducing them to his local Italian friends for a truly authentic Italian cycling experience. As Hampsten and his guests enjoy the view from Hotel il Perlo and tour Lake Como, he will not find himself a stranger to the area or the Lombardia region. In addition to frequenting Bar Agusto near Bergamo with his 7-Eleven teammates, for four years as a young racer, Hampsten lived in the small village of Vacallo, Switzerland, just across the Italian border near Como. This valley between Lake Lugano and Lake Como provides easy access to the training roads of both lakes and surrounding mountains. In those years Hampsten became very familiar with the challenging climbs around Lake Como as he used the roads to prepare for the greatest races in the world. A natural climber, Hampsten would seem to be destined to do well at the season’s final Monument, the Giro di Lombardia, but as many accomplished pros have found themselves at the end of the long race season, his form seemed to dilute right before the race and he never found great success at the Race of the Falling Leaves. Nevertheless, he holds nothing but good memories of the area, including exquisite Risotto alla Milanese and staying at Villa Flori in Como with his 7-Eleven and Motorola teams. Join us on Friday, July 6, 2018 at 9 p.m. the Ghisallo Cycling Museum for this special presentation by Andy Hampsten of his 1988 Giro d’Italia Maglia Rosa to the museum’s collection.